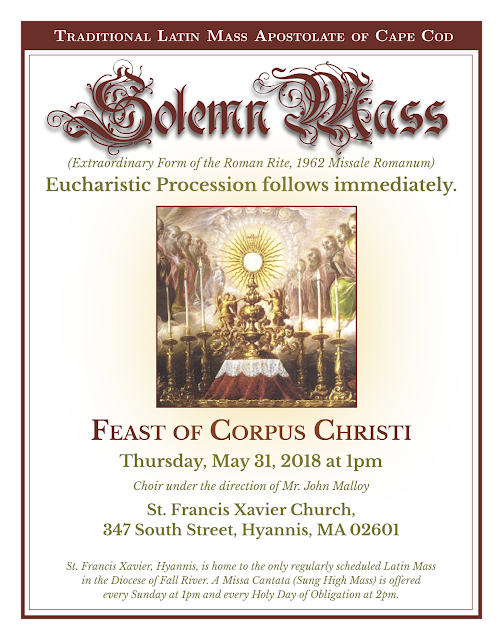 The Traditional Latin Mass Apostolate of Cape Cod will sponsor an Extraordinary Form Solemn Mass for the Feast of Corpus Christi at St. Francis Xavier Church in Hyannis, Massachusetts (347 South Street), on May 31st, starting at 1:00pm. A Eucharistic procession and Benediction will immediately follow. Since 2001, Cape Cod has been home to the only regularly scheduled Sunday and Holy Day Latin Mass in the Diocese of Fall River. In 2009 the Mass was moved from its original location in Chatham to Hyannis. The first Solemn Mass since the postconciliar reform was celebrated in this historic church on the Feast of the Epiphany, 2016.